The ArtTrak blog has been created as a discussion forum for the arttrak.com. Periodically ArtTrak also sends out Newsletters to their subscribers and this information after publication is also added to the blog. While much of the blog is devoted to African, Pre-Columbian, Oceanic, American Indian, and Folk Art, we are also very involved with appraisal and authentication issues. Your comments are welcome. 1. LIMA (AFP).- Introducing the Lady of Cao: using high-tech 3-D printing and based on the skull of an ancient mummy, scientists have reconstructed the face of a woman who governed in northern Peru 1,700 years ago. 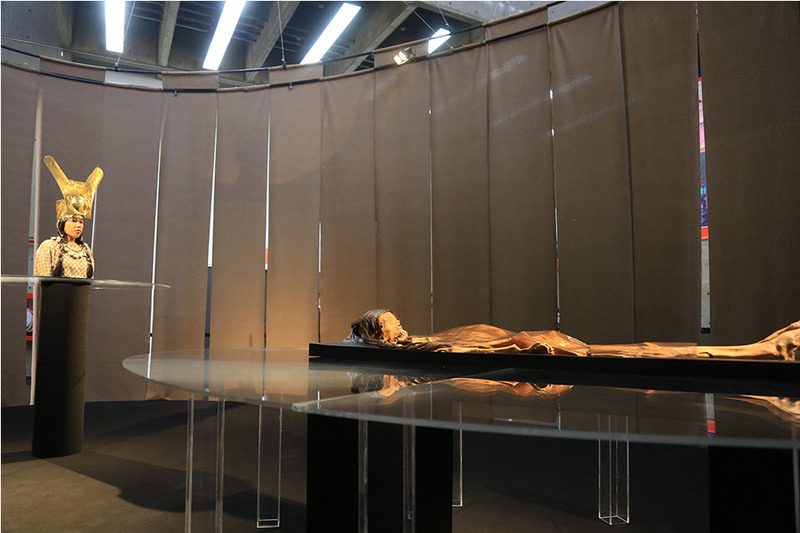 The woman's mummified remains were discovered at the Cao Viejo adobe pyramid in 2006 in the Chicama Valley, just north of the modern city of Trujillo. "Technology allows us to see the face of a political, religious and cultural leader of the past," Culture Minister Salvador del Solar said when he unveiled a life-like bust of the woman on Tuesday in Lima. The woman, dubbed the Lady of Cao, belonged to the Moche culture that thrived in the northern coastal region between 100 and 800 AD. She had been buried with metal items and wooden scepters wrapped in copper that symbolized the power she wielded when she was alive. Archaeologists say she is the first known female governor in Peru. Before this experts did not belive that women had any governing or religious authority in pre-Hispanic Peru. Scientists worked for 10 months to replicate the woman's face by analyzing her skull structure and comparing it with pictures of female residents of Magdalena de Cao, the town nearest to the pyramid. Tatoos are still visible on the woman's mummy, which was also on display at the event. 2. MEXICO CITY (AFP).- A giant temple to the Aztec god of the wind and a court where the Aztecs played a deadly ball game have been discovered in the heart of Mexico City. Archaeologists unveiled the rare finds Wednesday after extensive excavations, giving journalists a tour of the semi-circular temple of Ehecatl-Quetzalcoatl and nearby ball court. Records indicate that Spanish conquistador Hernan Cortes first watched the ritual Aztec ball game at the court in 1528, invited by the last Aztec emperor, Montezuma -- the man whose empire he went on to conquer. Historians believe the game involved players using their hips to keep a ball in play -- as well as ritual human sacrifices. Archaeologists uncovered 32 sets of human neck bones at the site, which they said were likely the remains of people who were decapitated as part of the ritual. Only part of the structure remains -- a staircase and a portion of the stands. Archaeologists estimate the original court was about 50 meters (165 feet) long. The temple, meanwhile, is a giant semi-circle perched atop an even larger rectangular base. The whole thing once measured some 34 meters across and four meters high, archaeologists said. The ancient structures stand in startling contrast with the sprawling mega-city that now surrounds them, which was built atop the ruins of the Aztec capital, Tenochtitlan. They are just the latest ancient vestiges to be discovered in the historic city center, at what is known as the Great Temple site. "The discovery we are looking at is a new chance to immerse ourselves in the splendor of the pre-Hispanic city of Tenochtitlan," Culture Minister Maria Cristina Garcia said. A hotel formerly stood on the site of the newly discovered ruins until 1985, when it collapsed in a catastrophic earthquake that killed thousands of people. The hotel's owners then noticed the ancient remains and alerted the National Institute of Anthropology and History. Archaeologists believe the temple celebrated the god of the wind and was built between 1486 and 1502. Officials said they plan to open the site to the public, although no date has been set. 3. MEXICO CITY.- Archeologists in Mexico said Monday they have unearthed what they believe was a dwelling where upper class Aztecs who resisted the Spanish conquest tried to preserve their customs and traditions. The structure, where Aztecs were also buried, is part of an old neighborhood in Mexico City called Colhuacatonco, famous for being a place where the Aztecs resisted the Spanish conquest in the 16th century, the National Institute of Anthropology said in a statement. 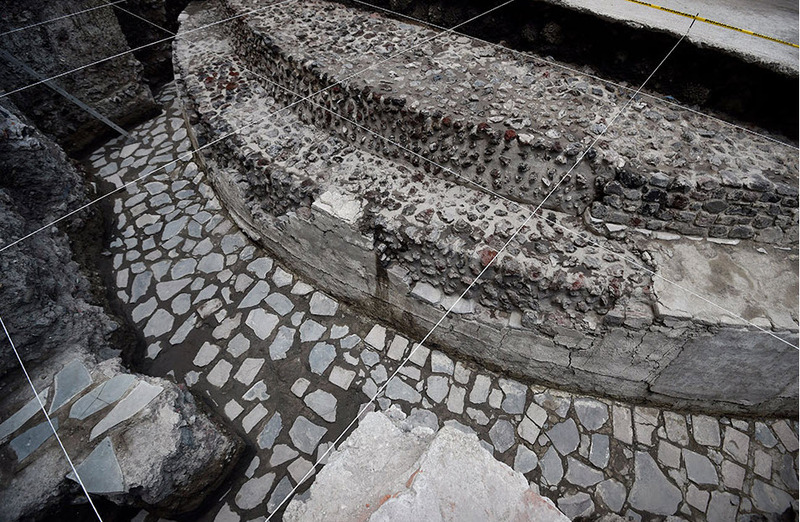 The new find buttresses the argument that Colhuacatonco put up passive resistance after the fall of Tenochtitlan, the capital of the Aztec empire, said Maria de la Luz Escobedo, the archeologist in charge of the project. "It is very likely that first and second generation descendants of Tenochtitlan people quietly carried out the burials of seven people (three adults and four children aged one to eight) using the traditions of their ancestors," she was quoted as saying in a statement issued by the anthropology institute. Archeological teams found skeletons that were nearly complete and buried in the fetal position, and also many bone fragments, according to a video released by the institute. The burials were done in the corners of the dwelling area and at the entrances, and have been dated to the time of Aztec contact with the Spaniards. Funeral offerings were found: a small figure of a coyote, a bracelet with shells, two small knives made of obsidian and ceramics from that era. Objects were also found that suggest a mixing of the two cultures, such as figurines of people with non-Aztec features and wearing hats. "What we detect in the materials is 'that which is Mexican,' the blending that began to take place after the Spanish conquest was complete," said Escobedo. The rooms of the dwelling were built with stone, suggesting they were for important Aztec people and their relatives rather than common folk. The most striking feature is a three meter by four meter (10 foot by 13 foot) area that was probably used for ceremonial acts. Its polished and well-preserved floors have a design in the center, showing a circle with black spokes -- possibly a representation of a shield. Art Trak has been an online tribal art resource since 1991. Search our extensive tribal art databases, or browse the African, Pre-Columbian, Oceanic, and American Indian art in Shango's galleries. Hire our expert appraisers for art authentication and appraisal services. The Arttrak blog features articles about tribal art, appraisal and art topics and more. Our newsletter will keep you up to date with information about Tribal Art related news and stories. Our mailing list get sneak peeks of objects before they are available to the public, and information about objects sold on a private basis. Copyright © , ArtTrak, BAACS, & Shango Galleries. Website by Design Half Full.